Eric Bickernicks is an industrial filmmaker here in New England. Fifteen years ago, he wanted to have something more substantial than a closet of corporate training videos to show his grandkids. So he wrote, shot, and then tried to sell his first independent feature film. He blogged steadily throughout a long and adventurous learning experience. In of those posts, he talked about “Rebel Without A Crew,” Robert Rodriguez’ book about the making and subsequent success of “Mariachi.” After acknowledging how the book inspired him, he made a great cautionary allegory about the dangers of seeking advice from successful people. Let’s say that over any given period of time, a thousand skydivers jump out of a plane only to have both their main and reserve parachutes fail. Let’s say a dozen out of those thousand survive…two even hobble away with just minor injuries. You’re a skydiver and you’d like to learn how to survive a 12,000 foot free-fall. So, easy: you should ask those dozen people how they did it and follow their advice…right? Nope. All they can tell you is what happened to them. They’ll tell you about the specific situation and their specific opportunities, and the choices that they made in response. If it’s even possible to replicate their moves, they probably won’t even remotely apply to your situation and even if they do…it’s possible that they just got lucky. It’s a great allegory that describes a universal truth. I do a lot of Q&As after my talks and I’m sometimes asked about the business of being a working journalist in this modern age. How did I build my audience? How did I successfully find so many outlets across so many kinds of media? What advice can I give to someone who wants to do what I do for a living? Carole is a top representative who specializes in a sub-category of writers: people who want to share their particular and peculiar knowledge with a wide audience. She’s agent-ed me through about a dozen books by now and her expertise in getting ideas to market has always blown me away. I send her an email and say that I think (X) would be a good idea for a book. She helps me to spot the problematic areas and leads me to put together a focused proposal. She handles the contracts, she deals with it when everything goes very right and she deals with it when some things go very wrong. She’s represented all kinds of authors who write about all kinds of topics, and she’s been an agent and an editor for decades. Carole is, truly, Finest Kind, and that comes through in this book. Will the information guarantee you a successful book launch and Harry Potter-scale sales numbers? Naw. Remember: skydiving advice. But I’ve never seen a book that does such a complete job of capturing all of the variables that go into that alchemy. …and this book explains, in detail, multiple ways that you can do each of those things. The book contains specific examples and plenty of case studies with successful authors. And yes, many of those authors certainly owe much of their success to Carole’s savvy. You won’t have enough time or energy to do everything you read about in this book. But you’ll have a broad understanding of all of the opportunities available to you, and you’ll be able to build a solid, personalized game plan. Maybe what I like most about this book is its sedate and sober tone. I just checked the cover to make sure and nope: there isn’t a single exclamation point to be found. This isn’t “The Golden Highway To Your MILLION DOLLAR Book!!! !” This is a reasonable and informed explanation of the things that a Sharer Of Expertise ought to be doing if they truly want to make a go of it. You won’t get there by just starting a Tumblr and waiting for pageviews and ad checks to roll in. You shouldn’t become bitter and confused if you self-published a Kindle title six whole months ago and The Today Show has yet to call you out of the blue and make you their official correspondent on that subject that you know lots about. I’ve often reflected on my career with great gratitude. I was born exactly late enough to build my journalism career upon the business model that started to shape itself in the 1990s. If I’d been born five years sooner, I would have set conventional goals: freelance for a newspaper, then land a staff position at a newspaper, then get promoted into an editorship at a newspaper. But I was born at the right time. I define myself as a Sun-Times columnist but that’s just a small part of my reach. I feel like I have a point of view that’s valuable and I know I’d be frustrated without all of the different outlets that I’ve developed for that point of view. I’m certain that I wouldn’t have the kind of job security I now have as a name-brand tech pundit, as opposed to an employee of a single publisher, toiling under an anonymous byline. It’s exciting to be in such a position. 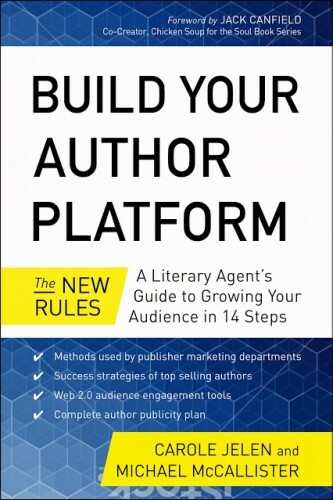 I’m planning on creating (as Tim Cook has recently taken to saying) “an exciting new product category” and it feels like I can just go right ahead and do that, because I have (as the book describes it) an “author platform.” God know how I got it, but I have one. I didn’t have this book to advise me in my career, but I certainly recognize and can second the advice I saw in it. Carole told me about the book a few months ago and I was excited to read it when my comp copy arrived at the house. If I didn’t think it was a terrific book, I’d just Tweet about how this friend whom I respect and admire and have worked with for two decades has a new book out, and I’d leave it at that. WordPress tells me I’ve just written about 1200 words. Take that as my endorsement. You’re probably not lucky enough to have Carole Jelen as your book agent, but now you’re lucky enough to have so much of her expertise available to you for just a $17 cover price. Here’s an Amazon link. Previous PostPrevious Happy Star Wars Day!